Our generous donors continue to support us in our endeavors to make a difference to dogs and cats in need. Here are some ways you can help fund ROAR. Towards our Annual Appeal – Click Here for the 2018 Fall Appeal Newsletter. No donation is too small – we greatly appreciate your help! Please help make this years Annual Appeal a success! The ROAR shelter accepts donations of gently used pet supplies, towels, toys and blankets/comforters up to full size. We do not take sheets, mattress pads, pillows or pillow cases. We also accept opened and unopened bags of dry dog and cat food. Canned dog and cat food must be unopened and not exceeding its expiration date. Please note that the opened bags of food are donated to Wildlife in Crisis. It takes a a lot of donations to make sure we have what we need to keep the shelter running smoothly. We need goods for both the animals in our care and also the people. 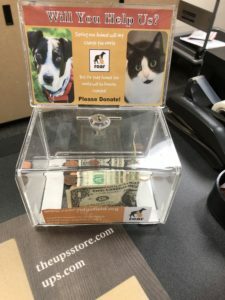 In partnership with Amazon.com and Amazon Smile, While shopping for your favorite things you can make a donation to ROAR when you select Ridgefield Operation for Animal Rescue Inc as the charity you support. ROAR also maintains an online wish list for shoppers who wish to donate much needed items for our shelter pets while they shop online. Each donation represents something that we need every day in caring for our shelter pets, like vaccinations, Frontline, etc. The Giving Tree can be found at one of our yearly events. You can also find items on amazon smile – so when you shop you can make a donation to ROAR too. As part of our Community Outreach, ROAR established this fund to assist pet owners, who are experiencing financial hardships, and need assistance with various veterinary services (this may include vaccinations, spay/neuters, medications, etc). This fund is reserved for providing veterinary services and medical supplies to the animals at the Donofrio Family Animal Shelter. Give a Memorial Gift to honor the lives of people who celebrate the human/animal bond, or a companion animal that changed the lives of those it loved. Celebrate special occasions in a powerful way. Perfect for the friend or relative who has everything and loves animals! ROAR will send a personalized greeting in honor of your gift. Our goal is to help heal the emotional wounds of military veterans by pairing them with a shelter dog that is specially selected to match his or her person. If you are a civilian or military federal or postal worker, please remember ROAR during the annual Combined Federal Campaign (CFC). Through payroll deductions, you can make a difference to your favorite charity. ROAR’s CFC Designation Code is: 69195. For more information, please see: www.opm.gov/combined-federal-campaign. We can help you set up a Charitable Gift via an Annuity or other giving tool, to help cover annual operating expenses of the shelter. If your business is interested in becoming a “Friend of ROAR“, please contact us at director.roar@gmail.com for more information. Please choose the purpose for your donation, and then click the "Make a Donation" button to continue. Thank you! * ROAR is a private, non-profit, tax-exempt 501(c) (3) organizations founded by volunteers in 2000. Your contribution is tax-deductible to the extent allowed by law (please consult your tax advisor).